Kinetico Unity Water Conditioning was honored as the 2014 West Unity Area Chamber of Commerce during Chamber’s annual banquet held on November 5. Kinetico – Unity Water Conditioning, originally started by John Woolace in 1954 and later sold to the father and son team of Ralph and Terry Rupp in 1978, has been a well known and well respected West Unity business for decades. Terry Rupp, now the sole proprietor of the business, operates two locations, one in West Unity and one in Wauseon. Currently Rupp employees nine dedicated professionals who work to provide the best in water services to all of Northwest Ohio, Southern Michigan, and parts of Northeast Indiana. Whether you’re looking for filter systems, or saltless systems for your commercial location or home, the Kinetico – Unity Water Conditioning team is there to meet your needs. As well as having established themselves as a thriving and successful business, Kinetico – Unity Water Conditioning has also been a member of the Chamber since the chamber’s inception and has always been on-hand to offer both their assistance and bottled water during local festivities. Kinetico – Unity Water Conditioning would like to thank both their dedicated and hard working employees as well as their customers, whom have provided them the necessary support to find their current success and who will be the driving force that will hopefully lead to several more decades of the business’s success. 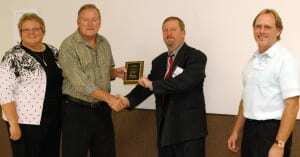 Be the first to comment on "Kinetico Recognized As West Unity Area Chamber Of Commerce Member Of The Year"